I have long been a list maker. I am one of those people who used to add things to my list, as the day progressed, just for the pleasure of crossing them off. My habits told me was that what I really enjoyed was the sense of accomplishment that I got from a day of doing. Although I still make lists occasionally, I’ve shifted in the last five or six years, away from “to do” lists, focusing more on being. However, I was delighted today to read about a new-to-me type of list making that appeals to my creative side. I came across the “Ta Da” list in Walking in This World. 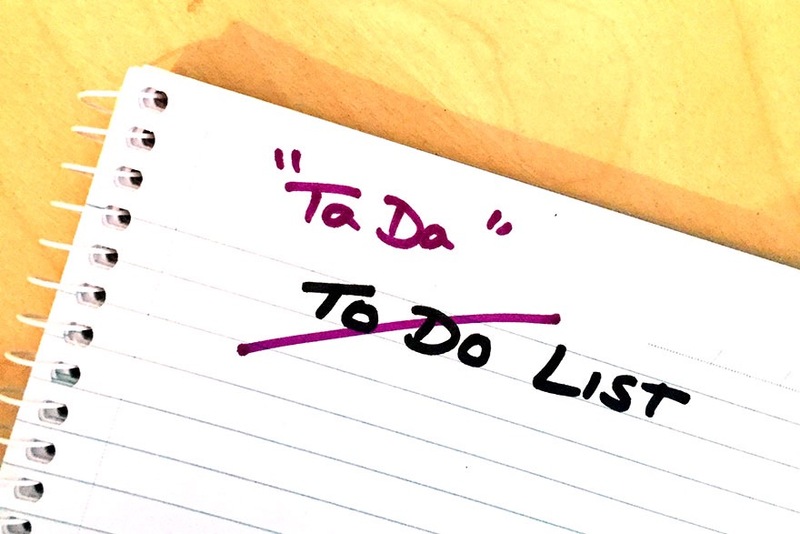 Author Julia Cameron suggests creating a Ta Da list, rather than working from a To Do list. The list of Ta Das, as in Look what I did…Ta Da, highlights creative actions and steps during the day, rather than focusing on what didn’t get crossed off the To Do list. 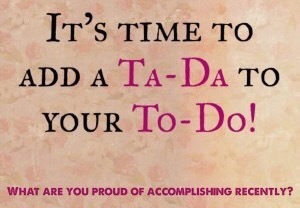 Ta Da is accomplishment oriented, rather than task oriented. * I finished watching a new Netflix series this morning, The OA, Season One. This mind bending series, the first I’ve ever binge watched over a weekend, goes on my creative list because it was so original, clever and imaginative. I’ll be thinking about this show for days. I’d recommend for ages 16 and up, as a couple of scenes are for mature audiences only. * Read a chapter in Walking in This World, The Practical Art of Creativity, where I embraced the Ta Da List. * Free writing on ideas for the Year of Inspiration blog this year. I wrote these categories for “making life a little more tender (gentleness, concern, sympathy, from the Latin word meaning ‘delicate’)”: compassion toward others, being Light, Love, and Inspiration, offering peace, joy, hope, understanding and forgiveness to others, giving time, resources and money to assist others, being present and witnessing another’s life, listening, being empathetic and sympathetic, walking alongside. I am open to other tender ideas. I wrote these categories for “making art a little more robust (strong, healthy, vigorous, from the Latin word meaning ‘oak-strength’)”: writing – storytelling, blogging, essays, free writing, poetry, drawing, painting, coloring, gardening, clothing design (a new interest), cooking, decorating, vignettes, repurposing, photography, mixed media, collage, building, music, movement – dance, zumba, tai chi, yoga. I am open to other robust art ideas. * Read about blogging, and about communicating with the Divine. Ta Da! There is my list, and the creative steps I took today, that are in alignment with this journey I am on. The OA inspired compassion in me as well, and a greater awareness of the importance of reaching out to help people, youth in particular, and accepting others where they are. Ta Da is an accomplishment accompanied by fanfare and a bow of acknowledgement. I’m thinking of it as a daily, joyful pat on my back, and a playful high five with the Divine.